Dr. Linda French is Professor of Physics and past Chair of the Physics Department at Illinois Wesleyan University, where she has been a professor since 2002. She received her A.B. in astronomy from Indiana University and a Ph. D. in planetary astronomy from Cornell University. Her scientific research, funded by the National Science Foundation, concerns the study of the shapes and surfaces of asteroids and comets. She is a frequent guest observer at Lowell Observatory in Arizona and at Cerro Tololo Interamerican Observatory in Chile, and is often accompanied by students on these research trips. During her sabbatical in 2009-2010, Dr. French was a Visiting Professor of Physics at the University of York, England where she investigated the life of York astronomer John Goodricke (1764-1786). She has given lectures on Goodricke and his mentor Edward Pigott in York, Boston, and Toronto, and at major observatories in the United States and Chile. Linda has receiving grants and awards in recognition of her scientific and educational work (e.g., asteroid 3506 French) as well as for her historical research. She is the 2016 recipient of the Kemp Foundation Award for Teaching Excellence, the highest award for teaching at Illinois Wesleyan. French, L. M., R. D. Stephens, D. Coley, L. H. Wasserman, J. Sieben. 2015. Rotation lightcurves of small jovian Trojan asteroids. Icarus 254, 1-17. Emery, J. P., F. Marzari, A. Morbidelli, L. M. French, and T. Grav. 2015. The complex history of jovian asteroids. arXiv1506.01658. I was interested in astronomy at a very young age, from the time someone gave me My Little Golden Book about the Sky. My school did not have a strong science program, and I was not prepared for university-level physics. I went from astronomy to English to elementary education as a major until I had to take a general education science class as a junior. I fell in love all over again and changed my major back to astronomy as a junior. Doing things the easy or straightforward way has never been my way. You held a variety of interesting positions at different types of institutions after receiving your Ph.D., how did you choose your current institution, Illinois Wesleyan University? Part of it was sheer survival. When I left grad school I was a trailing spouse and feeling very burnt out. I had come to enjoy my work as a teaching assistant to Carl Sagan while at Cornell, and that led me first to a leave replacement position at Bates College and then to teaching at MIT where I also did research in Jim Elliot’s group. My first full-time faculty job was at Wheelock College in Boston, where my students were preparing for careers as elementary teachers and social workers. I loved working with them, but I wanted a position where I could work with science majors and where teaching and research could be combined. Illinois Wesleyan made that possible. What skills do you think best helped you get the jobs you were looking for over your career? People skills are every bit as important for teaching–perhaps more so–than scientific brilliance. Of course, there’s no substitute for knowing your stuff, and I love it that my students appreciate my research. But being able to relate to what beginning students–or students at any level–understand (and what they do not yet understand) is vital. I sometimes teach a first-year writing class; most science students don’t have any idea of how important writing will be in their careers. That time spent as an English major served me well. If someone is considering taking time away from full-time research, as I did, I think it’s vital to mainta in connections with the field. After a 10-year hiatus from having NSF funding, I was asked to serve on a review panel. A long-time colleague told me “If you’re going to do this kind of work, you ought to have some of the fun of research!” I made a few calls, and within a few weeks I was teaching a young postdoc whose thesis was in comet spectroscopy about asteroid photometry. In short: keeping in touch with colleagues is important. When I was hired, there was a very strict policy here that startup funds could only go toward equipment (computers did not fall into that category). As an observer, all I needed were travel funds and computers. I tried hard to negotiate for these, and I eventually got more than was initially offered. Calling from a mountaintop in Chile when I had many gigabytes of data to transport home worked miracles. That’s a hard one! It probably has to be the survey course for non-majors, which I teach almost every semester. I like it because I get to interact with art majors and English majors, athletes and opera singers…students from all over the campus of a liberal arts college. I also remember what it felt like when I was out there taking a gen ed astronomy class. Not all of them will be converts the way I was (good for the profession! ), but most of them find their last science class in college to be a good experience. A year ago I had the experience of a lifetime: I directed our London Program, in which I lived in London for the Autumn semester, teaching the History of Astronomy to eleven IWU students. We looked at rare editions of Ptolemy, Copernicus, Galileo, and Kepler and visited the Royal Greenwich Observatory, Royal Society, Science Museum, and Royal Astronomical Society. During a trip to York I shared with them my work on the York astronomers John Goodricke and Edward Pigott at the historical house where Goodricke lived and made his observations. That was a semester I will never forget. How do you involve students in your research? I have a Research at Undergraduate Institutions grant from the Planetary Astronomy program at NSF. Students accompany me on trips to Cerro Tololo, observing, reducing, and analyzing data. They are co-authors and some have accompanied me to meetings. 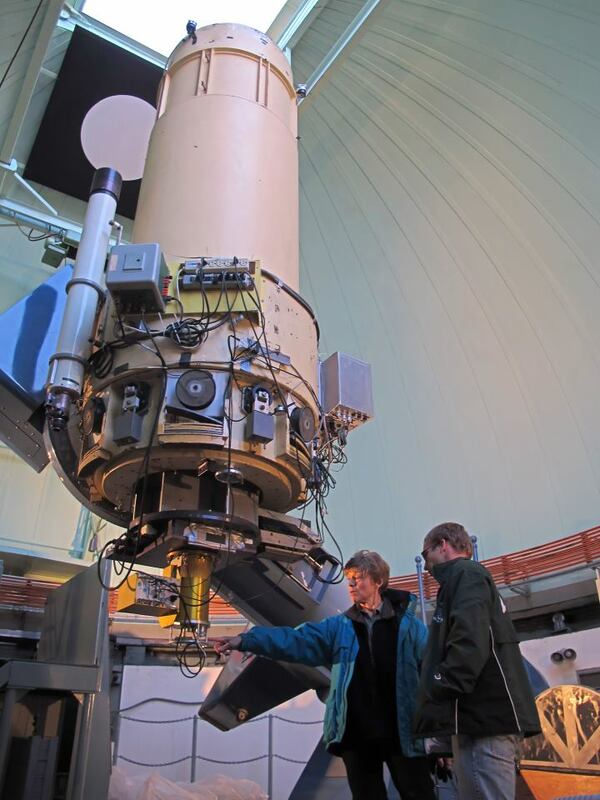 The university has helped to support research by upgrading our campus observatory. During the first year of the NSF grant, I was able to hire three students. Their observations led to our receiving an IAU observatory code (W04), and one of the students went on to publish asteroid photometry in a refereed journal. How do you manage all of the different demands on your time? And/or how do you find time for your priorities outside of work? Sometimes it feels as though the answer should be “very badly.” As I’m getting older, I’m finally learning that I don’t have to re-invent the wheel every time. Last semester’s class on gravity can work just as well this time, as long as it looks as though I just thought it up. Working twice as long on something doesn’t necessarily make it twice as good. These are difficult lessons to learn. Don’t limit yourself. Don’t tell yourself “I couldn’t get in there,” or “I could never get that fellowship.” I’ve come to tell myself that if I don’t get turned down for a few things occasionally, I’m probably not reaching high enough. I only wish I’d adopted that philosophy a lot earlier! Thanks for taking the time to share your fabulous insights Linda! If you would like to volunteer yourself or others to help out by either being interviewed, or conducting an interview, send a note to kelsi.singer at gmail.com.